Tours Saturday 11 a.m. to 6 p.m. Sunday 12 p.m. to 6 p.m.
Our farm winery and vineyards are located right outside the heart of the village of Waterford. The tasting and barrel rooms are housed in a restored farm structure adjoining our large, old bank barn near the 2-acre vineyard on our farm. An additional 8 acres of our vines nearby complete the vineyards. All of our wines are crafted entirely by hand. No mechanical pumps are ever used to handle the fermented pulp or wine during aging to preserve the true character of the variety. Our wines are all aged in French oak barrels to further enhance them during the aging process. Our winemaking philosophy values quality over volume, so we reduce the grape crop by hand before it is fully ripe to intensify the flavors. This year we are pleased to offer a new selection of Elderberry products. 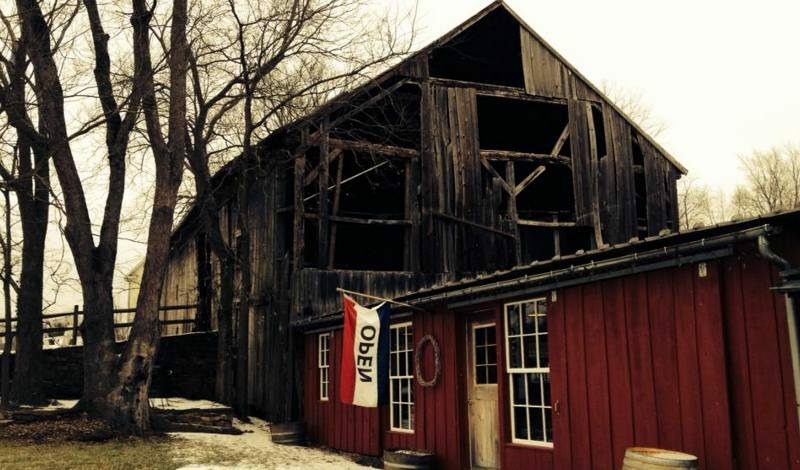 The farm structure which houses our tasting and barrel rooms adjoins our large, old bank barn that will be restored. A word about the barn — the barn was built using post and beam construction and mortise and tenon joinery. Some of the heart pine floorboards are 18” wide. From the barn cellar (in the back), you can see hand-hewn oak joists supporting the floor above, and the stone foundation and cellar walls which were put together using lime and sand mortar. The barn’s stone foundation is smaller than the barn structure you see above it. We believe that an older, smaller barn previously existed on this foundation, possibly burning down around the time of the Civil War; and that a larger barn was rebuilt over the original stone foundation, as you see it now. A spring-fed creek runs year-round behind the barn and winery down towards Catoctin creek, which flows past the Mill in Waterford. There is also a natural spring which runs underneath the barn that has been piped down to feed into the creek.